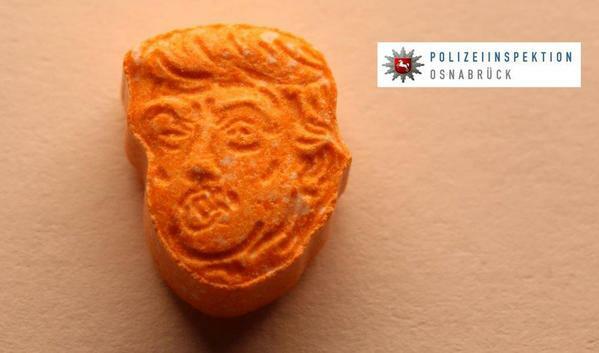 How many have looked at Donald Trump and thought, ‘What’s he on?’ and ‘Was it fully tested?’ In Germany, police have seized 5,000 Ecstasy tablets modelled on President Donald Trump’s head and skin tones. Police in Osnabrueck, northwest Germany, say they found the drugs while checking an Austrian-registered car on the A30 highway Saturday. They say the people in the car, a 51-year-old man and his 17-year-old son, told officers they had been in the Netherlands to buy a vehicle but hadn’t succeeded so were returning home. Officers said they found about 5,000 of the orange, Trump-shaped Ecstasy tablets along with a large, but unspecified quantity of cash. A judge on Sunday ordered the father and son kept in custody. The car was seized. You kind of wonder who wants to eat Donald Trump’s head. Maybe someone that orange counts as one of your five a day?